by Talen on June 9, 2010 in Thai Festivals, Thailand Events 2 Comments - Leave a comment! 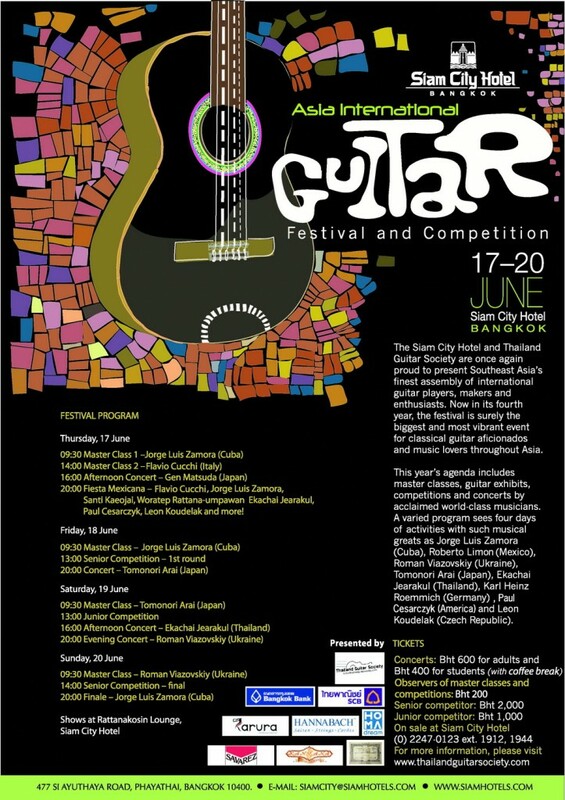 The Thailand Guitar Society in conjunction with the Siam City Hotel present the 10th annual Asia International Guitar Festival June 17th through June 20th at the Siam City Hotel in Bangkok. The festival will play host to many international guitarists as well as local Thai guitarists. The International Guitar Festival will also host several competitions including a senior & Junior competition. Some of the prizes include a choice of Guitars made by Yuichi Imai, Karl Heinz Roemmich or Young Seo as well as a guaranteed playing spot at one of several international and local guitar festivals. There will also be other activities to take part in such as concerts, master classes and exhibitions all held at the Siam City Hotel. Ticket prices for concerts, activities and competitions are as follows. Concert – 600 baht for adults and 400 baht for students (inclusive of coffee break). Audience for Competition - 200 baht per person. Observer for Master Class - 200 baht per person. Senior Competitor – 2000 baht per entrant. Junior Competitor – 1000 baht per entrant. Below you will find a program schedule for each night. More information such as what each program will entail can be found at The Thailand Guitar Society’s Asia International Guitar Festival page. 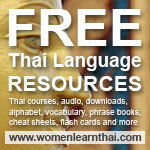 For more information on upcoming events and festivals in Thailand please check out the Thailand Events Calender. This one seems a beaut Talen. Do you know if they will be releasing videos on YouTube? Cat, I believe there will be videos released as there were some from last years festival…Next year I will definitely be in attendance!